And just recently a relative died suddenly and his house went up on the market. One day a friend of my relative’s asked his father, “Hey, did you find that, ‘special item’ that he’d hidden in the house?” The father looked blank. “What item?” The friend went on to describe a rare, expensive (about $100,000), piece of jewelry owned by my relative. Fortunately, the friend knew the hiding place in the house and they were able to retrieve it. It was a near thing, too, because an offer was placed on the house a couple of days later. 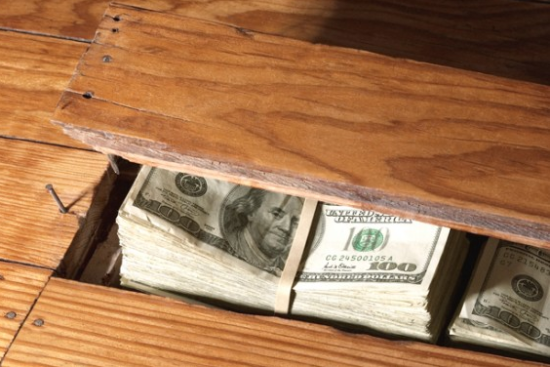 You hear all the time about people who move into a house and discover a fortune, or who buy furniture at a yard sale and find cash taped to the bottom of the drawers. Then there are the people who find money buried in the yard or stashed in the trunk of their “new” used car. Even the tales of people finding $1,000 in the pocket of a coat bought from Goodwill are common. People lose a lot of money this way every day and it makes me wonder: How is this possible? Admittedly I’m a fanatic about my money and valuable possessions and I don’t take the risk of hiding anything in my house. Bank vaults are my best friends. My wishes regarding my possessions and their locations are spelled out in various legal documents. But many people feel safer keeping things in their homes or cars. Which I can understand, to a point. It is nice knowing that you have total control of your money and possessions. But you run big risks with this approach. Obviously fire is the biggest threat. But you also have other disasters and theft to worry about. And then what happens if you simply forget about it? I can’t imagine forgetting about hundreds of thousands of dollars but I guess it’s somewhat common, judging by the number of people who report losses and finds. Or what happens if dementia hits and you have no choice but to forget? Or you get in an accident and can’t remember things? What happens if you die suddenly and you’re the only one who knows about your valuable items. Maybe you wanted that jewelry to be sold to pay for a relative’s education, but it’s not in your will and no one even knows you have the item. Your valuable jewelry will likely end up being found many years from now and it will belong to someone else. Don’t keep stuff in your house: Keep your valuable things in a bank vault and note in your will where that box is located. Keep money in a bank. It’s understandable that some people are afraid of the banking system, but it’s still far safer than your mattress or under the floorboards and it’s easier for your heirs to track down. If you must keep stuff in your house, keep a record of it: Put the location of your stash in your will so that if you die suddenly or lose your memory, your heirs can find your things and dispose of them the way you intended. It may also help to keep a master list somewhere accessible and keep it updated as you hide new things. You don’t have to list exactly what’s where, just some notes like, “Behind the third rafter from the garage end of the house,” can be enough to trigger your memory, or the curiosity of those tasked with disposing of your assets should you die. Tell a trusted someone: Pick a person you trust completely such as a family member, a lawyer, a clergyman, etc. to tell what you have and where it is. That way, if something happens to you and you can’t speak for yourself, that person can locate your items for you. Note your items in your living will or trust: Think about this scenario: You’re disabled and your memory is gone, whether through accident or aging. You have hundreds of thousands of dollars lining the walls of your house that could buy you good care at a nice nursing home. However, your family only knows about the bank account that has $10 in it. So you’re put at the mercy of Medicaid and you’re stuck in a budget nursing home. Wouldn’t it be nice if someone knew about all that money? Oh, yeah. Thoroughly check and clean out anything before you sell it or give it away: Go through furniture drawers and coat pockets. Check under and inside everything. Look inside the linings of purses or jewelry boxes. Go over your car in detail before you trade it in. Before you close on the sale of your house, go through it one more time, poking at the floorboards and checking the rafters. You may not remember putting things in places (especially if you’ve lived somewhere for many years), so a good check before selling is warranted. Don’t tell everyone: While you want a few trusted people to know about your affairs, you don’t want everyone to know. So shut up about it when in public and around people you don’t know well. Otherwise you risk robbery. Lock up: If you’re stashing valuables in your home or car, at least lock the doors and take some basic security precautions to prevent theft. It sounds like common sense, but it bears repeating because people lose large cash hordes simply because they didn’t lock the door. I still don’t advise keeping things in your home or car. But if you simply feel that you must, at least take some precautions to ensure that your fortune isn’t lost by mistake or that you can’t get to it when you really need it. Don’t hide them where “helpers” can find them. My husband had $800 given to him while he was wearing a suit. He left it there for the weekend, thinking that was a good hiding spot until he could get to the bank. Meanwhile my mother in law came over (uninvited and unannounced) while we were not home and thinking she would be helpful went through the closet to take things to the dry cleaner. The money disappeared–neither she nor the dry cleaners said they ever saw it. Locks were changed. DH had told her several times not to be coming over like that. Suit didn’t need cleaning anyway and that isn’t the first time something disappeared from her “helping”. My friend’s father was a WWII immigrant who never trusted the banks. One night he decided he was going to die by morning and showed his wife a shoebox with $8,000 in it. When he didn’t die, he was mad about it and moved the money so his wife wouldn’t know where it was. When he did finally die they found $30,000 hidden throughout the house. It’s also common to hear stories about shark attacks. That doesn’t mean that shark attacks are common. You don’t hear all the stories of people who *don’t* lose their fortune. For many people, stashing gold at a bank is not an option. The government has confiscated gold before, and there’s no reason to think they won’t again. I also believe in keeping $10K – $20K in small bills at home, “just in case”. It’s hidden in plain sight. I too worry about selling the house and forgetting about the money and gold, but the location is such as to make that unlikely. I agree that losing big amounts as described is not really common. It makes the news because it is not run of the mill. If you don’t trust one single person, split the info how to find your secrets. E.g. Tell one person the way to a tree and the other the way from that location to the secret, without reveling to the second person where to start. I know of a charity shop that had the belongings of a person who had died donated to it. The items had hidden inside them, a HUGE amount of money. The money was returned to the rightful owners thanks to the Great British Bobby (policeman) who did the detective work! The rightful owners gave a very nice donation to the charity shop. I recently started cleaning out a house of a deceased person I co-owned it with. We decided when we split, he could live there since he couldn’t afford to buy me out as long as he kept it up. The house is a disaster! Filled with junk, counters covered in mouse feces, just horrible. Code enforcement got involved when they had to break down the door to get to him to take him to the hospital where he later died. I called people to come get the furniture. While they were on the way, I moved a chair away from the wall to clean behind it. A friend had been doing it a couple minutes earlier while I waited on the porch for the movers when he had to suddenly leave for lunch. When I moved the chair, I spotted a fifty! I looked closer and turned the chair upside down..out spilled lose bills and envelopes with over $20,000!! I wasn’t in the room when my friend was sweeping and wonder if he pocketed even more!!! The junk people came and took the chair and furniture a few minutes later. The deceased had a will. I don’t know if he mentioned the money in the chair in his will. I sure could use the money I found in the chair to get the house up to code. I had actually purchased the chair 25 years ago. WHO IS THE LEGAL OWNER? Of course, my friend, the sweeper, denied having found any.